I was surprised and pleased that I could hook up the WDH when I left Moab. I was concerned about being able to crank up the A-frame. Then being able to crank up the added weight to prepare for prying on the torsion bars. And finally, being able to pry on the bars. It all worked out well. No way, was I capable of doing this back in December. The next time I went to hitch up was more difficult. I left the pry bar on the bumper of the Ram when I pulled out of Moab. It was the factory one with curves forged in, to ease the procedure. Guano. I picked up a pry bar at Home Depot but I have to kick the torsion bars in when they are pried up high enough. Not the best time to be standing on one foot. Oh well, we’ll see how it goes. I listened to an audio book on the drive south, ‘Blue Labyrinth’ by Douglas Preston & Lincoln Child. Really good story. What a great way to get through a long drive. Couples could play an audio book through the car’s radio (if they could agree on a book). My podcasts continue to back up. I am getting SO much use out of my iPod touch. If I had cell access year round, I would have an iPhone. The iPod gives me everything except the phone, with no monthly charges. With the OverDrive app, I’m getting most of my ebooks through the library, rather than free-ebook sites. Much better quality of reading material. Remember, I don’t live with a TV. I had planned to spend a month in the Green Valley area of Arizona visiting with Pinball. Like old times, we went out after some geocaches. I got to meet her new cat and dog. Her cat, Mellow, is definitely mellow. We went out to eat a few times and I had the best grilled cheese sandwich I’ve had in a restaurant (mine are the best). It was at the Cow Palace (can you believe I went into a place with such a name?) in Amado. Didn’t even have grilled cheese on the menu but the cook put what I wanted on one. I was most thankful. Lynn was volunteering at The Animal League of Green Valley, and adopted her cat and dog from there. I was impressed with the cat enclosures. 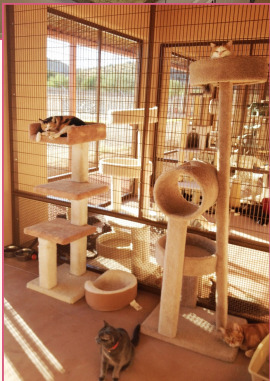 Each one had an indoor and an outdoor area with plenty of comfortable areas for the felines to snooze. And right behind there, is the Two Girls Pizzeria, where I had the best pizza I’ve ever tasted. Bear with me here; I’m getting to the title. Remember the monthly pages titled, ‘not quite enough’ and ‘now, maybe it has been enough’? There was the necrotizing fasciitis and its three surgeries, the skin graft, pneumonia, and anemia. When I got to Green Valley, I went to a clinic to see about getting my last two iron IVs and maybe see a hematologist/oncologist since my counts are still below the norm. The clinic sent me to a lab for some blood work, and the results showed my thyroid is not up to snuff. So now I’m taking a thyroid med. Bummer. They also had me read off from an eye chart. That did not go well so they want me to see an ophthalmologist. Maybe it’s time to have my cataracts taken care of. The nurse practitioner was concerned that at 67, I’ve never had a colonoscopy, so she set me up for one of those. As most of you probably know, the day-before prep is the pits. Lynn drove me up to Tucson for the upper endoscopy and the colonoscopy. Afterwards, while I’m still in bed, a nurse comes in and places a box of tissues on the bed. I’m thinkin’ this might not be good. The doctor then comes in with Lynn, who sits on the bed and takes hold of my hand. Uh-oh. The doctor found a large tumor, later found to be cancerous. We’re waiting for a surgery date. So it looks like once more, it’s into-the-breech. Guano. Thankfully I have Lynn here to help me through this. It seems I’m taking more from my friends lately, than giving. I’ve always thought I’ve been leading a healthy lifestyle (well, other than relationships). I’ve been a vegetarian for 46 years, no fish or any form of flesh, and I’ve always exercised with weights or bodyweight, hiked, mountain biked, and ran in the mountains and track skied and snow shoed in the winter. I’ve competed in various running races and was competitive in my age group. Never smoked but do drink wine and craft beers. But it comes down to genes. No matter how well one takes care of himself, if one’s genes are on the faulty side, it pretty much doesn’t matter. Hopefully, in another month or so, I’ll be back in the mountains. Mesa and Meadow are missing them as much as I am. I want to check out some things in the NM Sacramento Mtns. The elevation is only 7,100’ so it might not be cool enough in the summer. We’ll see. If that does not work out, I don’t have any idea where I will spend the summer. I sure don’t want to do a lot of driving this year. Most people pretty much stay within one chamber of their being. If I never try anything, I never learn anything. If I never take a risk, I stay where I am.